Our compost filter socks are made from the highest quality fabrics that filter out sediment and other non-source pollutants. This high quality fabric consists of heavy duty, durable polyester using a unique weave pattern. This netting has been tested in the field and has a minimum life of 36months. This is to give you peace of mind that your sediment control system is hard at work and will last. Compost filter socks are designed to be dragged and run over, this tough compost filter sock will provide high performance under the most demanding working conditions. It comes in a variety of different sizes ranging from 8” to 24” diameter with lengths from 10ft up to 180ft. Compost Filter Sock offers three types of socks. 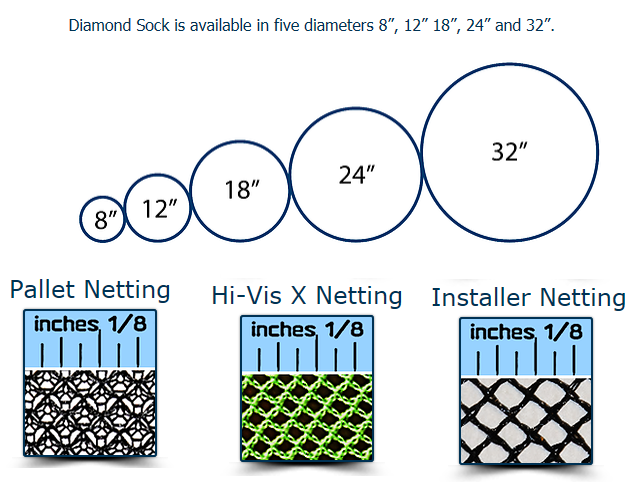 Each sock type has been designed for different filling and installing applications. All of our sock netting is made of high quality materials and made in the U.S.A.
We offer our heavy duty pallet sock that is designed to take the abuse of being installed by crews. We also offer our Hi-Vis X Green that is not only highly visible, but also made of very heavy duty multi filament weave that can handle being dragged and driven over at the jobsite. Finally, we offer our installer sock that has been designed to be used with blower trucks. The advantage of using this installion method is the sock in placed using our certified composted filler media as the sock is installed. This is best suited for very long runs of sock and for socks that are 24” to 32” in diameter. Blower trucks do offer both speed and the ability to place sock in places where traditional construction equipment cannot go. 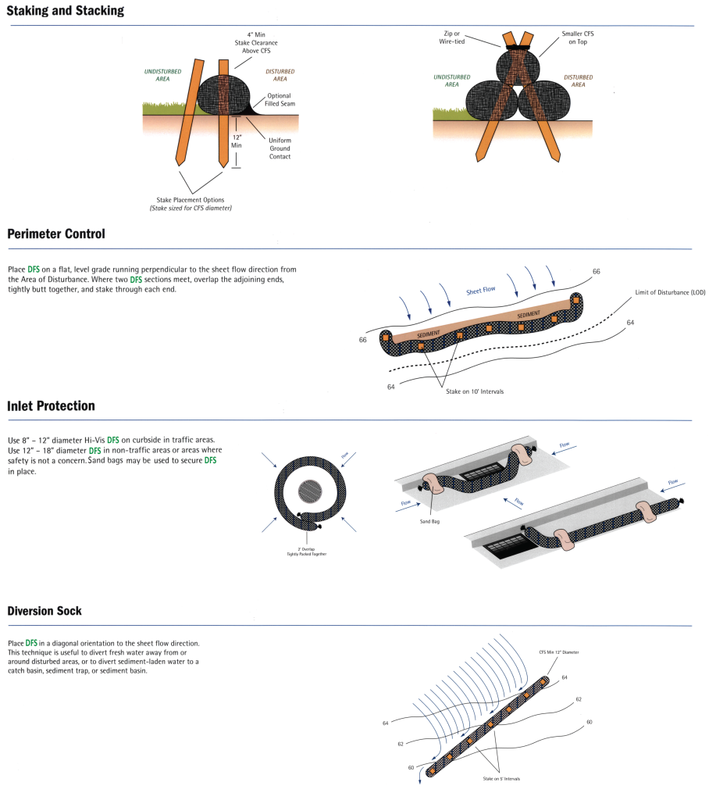 Areas such as wetlands, slopes, and wooded areas are some examples that you can use this installation technique.